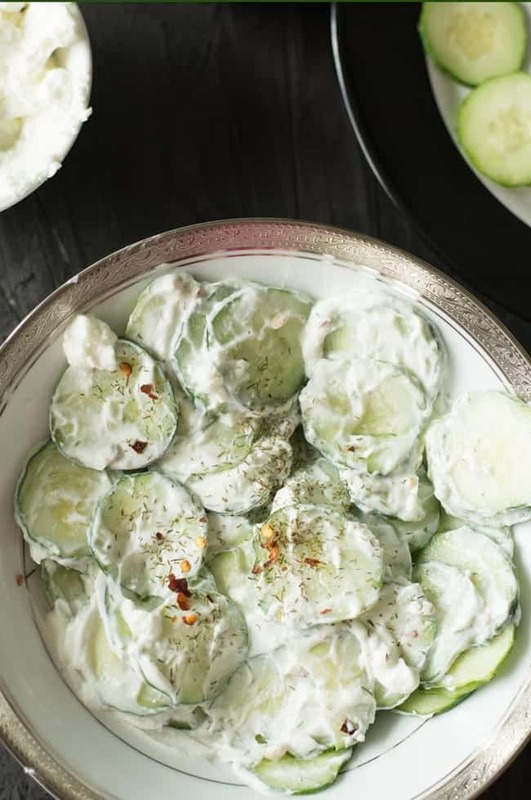 Greek yogurt cucumber salad is a healthy dish that you can treat yourself on this hot summer week. I need just a few minutes to make this dish that filled with the wholesome yogurt, fresh cucumber, and dill. 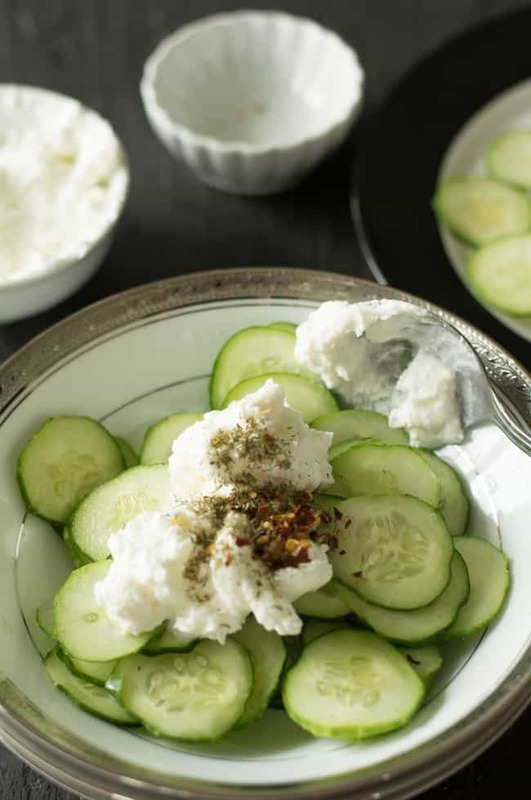 This mediterranean cucumber yogurt salad recipe gives you an energized feeling after a hard, tiresome day. Additionally, you can make it quick whenever you need it. I love to have this revitalizing and refreshing Greek yogurt cucumber salad all the time, whether for breakfast, lunch or dinner. Cucumbers act as a body coolant and give you a fresh feeling throughout the day during summer. I do not know about you. But as soon as the summer comes, I always feel dehydrated and tired. And need an extra booster for my metabolism. Summer months are sought to be in in the outdoor all the time. So as the outdoor cooking. Get yourself comfortable. And relish the grilled food outdoor. I bet you; this cucumber dill salad would be the best companion to beat the heat as well as the best partner for your barbeques. This Greek Cucumber salad is a cool rejuvenating recipe that I have ever come across. Greek yogurt has a creamy texture. When choosing the flavor, I always prefer plain Greek yogurt. Hence it can be easily customized to make a ton of recipes. Today I bought a big bag of tortillas. So just thinking of making some perfect cool dish to pair with it. And this salad would be the great companion. 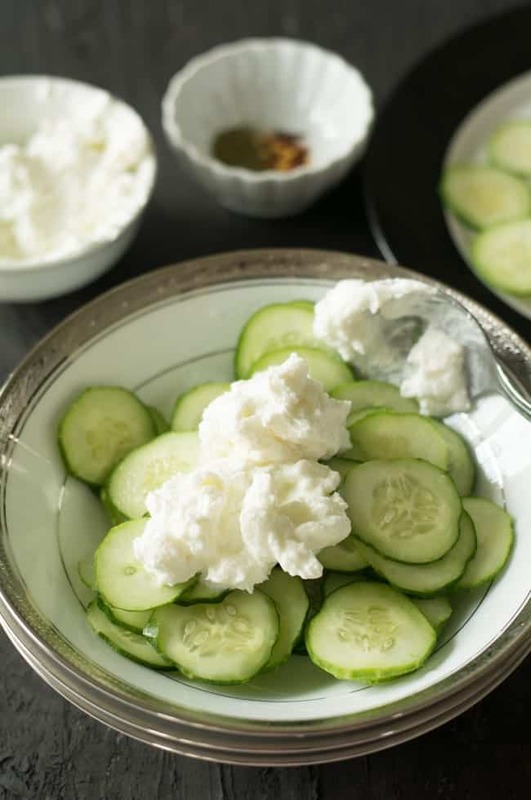 Make this Greek yogurt cucumber salad in just 5 minutes if the ingredients were handy. The satisfying yogurt salad is infused with dill. The Mediterranean inspired flavors of Greek salad will burst in each bite. 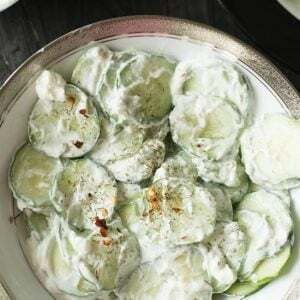 The buttery texture of the yogurt and the Striking of the flavor of cucumber makes this as a lip-smacking dish. You may customize the salad with the crunchy toppings for the more delectable experience. The combination of the yogurt and the Cucumber you will be amazed to see how these two flavors quickly transform when gets combined. I highly recommend adding dill leaves. If you have fresh, you’re lucky enough. If not, no problem at all, add dried dill leaves as I did today. 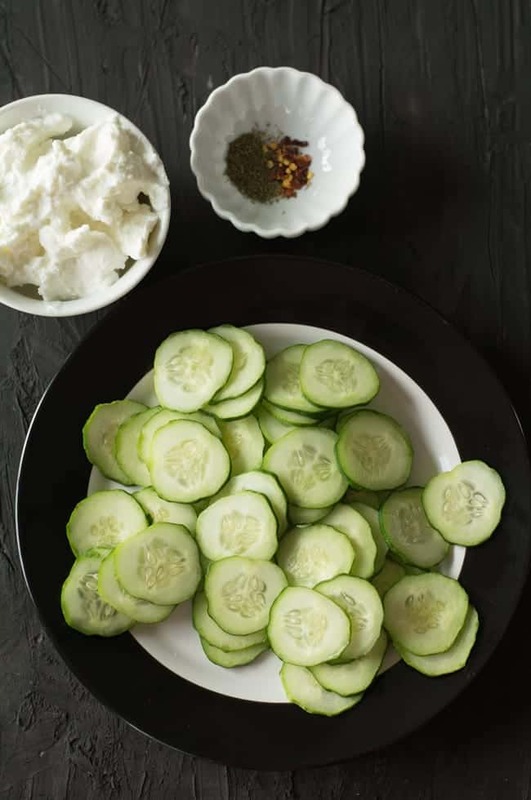 Dried dill is an excellent tasty seasoning for this Greek yogurt cucumber salad. This is a stress-free and straightforward salad recipe. I enjoyed serving this is the salad as a dip for an appetizer. It can be tortilla chips, hot chicken wings or anything. You name it, and this salad will pair it great for sure. If you are like me looking for skinny lunch, here you go this is your lifesaving recipe. I can have this Greek yogurt cucumber salad as my main meal. Are you thinking of serving for the crowd? And Looking for some interesting variations? No worries, add chopped green peppers, red peppers, olives. These make Greek yogurt cucumber salad looks more colorful. You may add red wine vinegar. I would strongly suggest adding this if you are looking out for rich variation. According to me, the basic requirement for any salad is that. I’m happy to share my most loved salad. Greek yogurt cucumber salad fulfills all these criteria. Now you know why this recipe is one of my most favorite. I would like to have the salad for everything, for the lunch, dinner or as the midday snack. When I crave for something during the daytime, I prefer having this instead of dumping myself with fast food junks. We need to go along with nature and consume the seasonal available fruits and vegetables. I feel nature is gifting us to have the excellent food according to the season. The summer months bring Lots of fresh cucumbers either from the backyard or other stores. These amazingly balances the body from the harshness of the season. So I’m trying to incorporate the seasonal vegetables as much as possible. And this Greek yogurt cucumber salad is one such delicious example. I always come home with a bag full of cucumbers after my every visit to the grocery stores. Generally, I used to have them raw. Slicing and sprinkling with salt and pepper is another simple way of consuming it, and it tastes delicious as well. We usually used to intake a lot of cucumbers in the summertime. It is convenient for me to munch on this cucumber as raw. But I cannot imagine of serving this way to my son. I should always give him in the form of well-made, good food. This is the more comfortable way to make my family eat vegetables. I know every mom undergoes something like this all the time. I like one thing about the Greek yogurt cucumber salad is that does not have any extra dressing, no added fancy vegetables. It is the point in the blank and has only the ingredients what it does needs. It is simple and fulfills the idea what it is served for. This made me visit the Greek restaurants very often nowadays. Greek Yogurt: To make the salad, always prefer to go with the plain Greek yogurt from the market. Because plain yogurt will not contradict the other ingredients. If you are using any flavored Greek yogurt, you may end up with a different dish than you what you’re trying to make. Cucumbers: You may use any cucumber, English cucumber, petite cucumber or others. Check before slicing them, as some may taste bitter. And these are not good for the salad. Dill leaves: If you have this in your pantry, you are lucky. Seasoning with fresh leaves gives out more aroma. But in its absence, you may also use dried dill leaves. Red Chili Flakes: I have added red chili flakes to add heat to the salad. But adding it is optional. How long this salad lasts? Store the leftover Greek yogurt cucumber salad in the sealed container. It stays good if it is consumed within a day. The cucumber leaves out liquid if it is stored for a while. Which makes the salad watery when stored for a longer time. 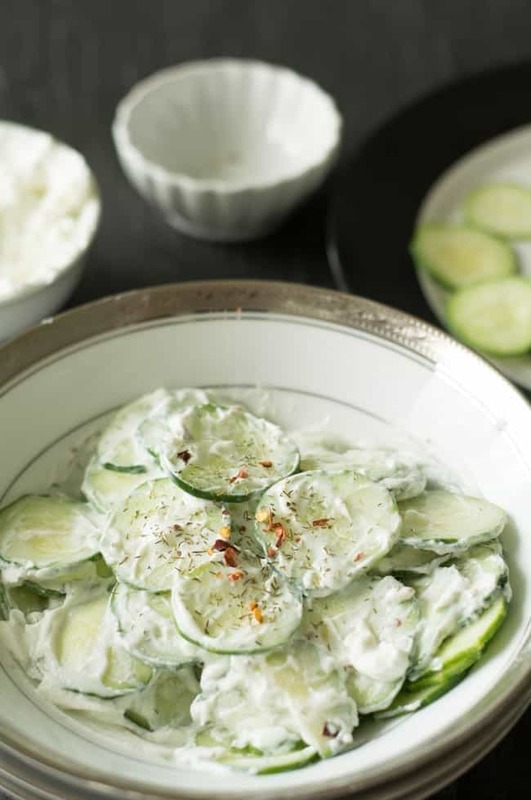 Greek yogurt cucumber salad is a healthy dish that you can treat yourself on this hot summer week. I need just a few minutes to make this dish that filled with the wholesome yogurt, fresh cucumber and dill. Wash and clean the cucumbers. Slice evenly. In a mixing bowl, add cucumber slices, greek yogurt, dill, red chili flakes and salt. Gently combine them with the spoon. Check the taste of cucumber before slicing. As cucumber tastes bitter at times.